It's Summer, it's Hot and your natural hair needs special care. What's more devastating than dry brittle hair? Dry brittle hair in 95+ degree weather. It's been hotter than a Mothah and summer just arrived. 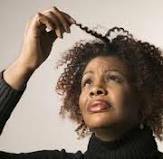 How does this intense heat affect your hair? You might think that the care of your hair would begin from misting and spritzing water topically. While this is true, the real moisture will come from within. You see, your hair is an extension of your skin and when you deal with the most effective way to care for your skin and hair, it's from within. Hydration is the key to a healthy head of hair. That hydration is to come from within as well as from topical products. You can add all the Shea butter or hair oils to your scalp you'd like, but without the ability to hydrate your body from within, you'll only get half the results you were looking for. You want to drink as much water as possible to keep yourself hydrated from within, at least half your body's weight. Good clean water, not a lot of sugar flavored drinks. Sugar will actually dehydrate you. Natural flavored drinks like fresh lemon water or fresh cucumbers, oranges or even watermelon that's been added to water will work very well. Then there's food itself. In order to nourish your hair follicles, it might be a good idea to eat foods that are actually going to nourish your body. When it's hot, no one wants to tie themselves down to an oven trying to prepare a meal. However, you can set up your grill and enjoy a nice cut of salmon or tuna with a hearty green salad. You'll get your omega 3, 6 and 9's in your fish and your chlorophyll in your hearty salad. What do I mean by hearty salad? It's a salad that can actually stand alone as a meal. Kale, spinach, broccoli, romaine lettuce, bell peppers (orange, green, yellow and red) cucumbers and red onions. Add a little olive oil, sea salt and fresh lemon juice and let it marinate while you grill your fish. You've got a meal that will not only taste great, it will nourish your body and provide you with great looking skin and hair. Your olive oil can act as a hair oil base for a hair serum. Add some coconut, castor and grape seed oil and now you can add moisture to your hair and scalp. You will not need a lot of oil. You want to use just enough to minimize the dryness and provide your hair with a light sheen. Too much oil will weigh your hair down and become a dirt and bug magnet. While it's known that oil and water don't always mix, you can add a few drops of Rosemary (3) and Lavender (3) essential oil to four ounces of water in a spray mist bottle and this will give you a natural spray mist for your hair. Be sure to shake it before each use. It's a good idea to allow your hair to get at least 15 to 30 minutes of sun. While the sun can dry your hair out, it will also provide your scalp with it's natural source of Vitamin D. The rest of your time should be spent wearing a hat that will help keep your scalp hydrated. Find balance. Believe it or not, the very things I've discussed in this article will help you have a very nice head of healthy hydrated hair. Enjoy the natural warmth of the summer heat!